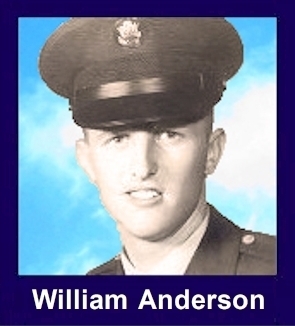 The 35th Infantry Regiment Association salutes our fallen brother, PFC William Edward Anderson, who died in the service of his country on February 9th, 1968 in Quang Nam Province, Vietnam. The cause of death was listed as Mortar. At the time of his death William was 19 years of age. He was from Lancaster, Ohio. William is honored on the Vietnam Veterans Memorial at Panel 38E, Line 43. The decorations earned by PFC William Edward Anderson include: the Combat Infantryman Badge, the Bronze Star with V, the Purple Heart, the National Defense Service Medal, the Vietnam Service Medal, the Vietnam Campaign Medal and the Vietnam Cross of Gallantry with Palm Unit Citation. William is buried in St Mary's Catholic Cemetery, Lancaster, OH. A sports-minded, musically inclined 1966 graduate of Bishop Fenwick high School became Fairfield County's 11th recorded casualty in the Vietnam War. William Edward Anderson 19, son of Mr. And Mrs. William R. Anderson, 610 Roosevelt Ave., was killed in action Feb. 9 while serving with an infantry unit of the U.S. Army. Mr. And Mrs. Anderson were notified personally Wednesday of the death of their son by Columbus Army Headquarters. Details as to exactly where and how he died were not given. The parents were told that they would be notified by telegram as to when the body would be shipped back to the States. Young Anderson was active in sports at Bishop Fenwick, playing the outfield and first base and pitching. He also played some basketball. He received numerous trophies for his guitar-playing, which was his interest since the second grade. "Bill" was employed by Dave's Pure Oil on Memorial Drive and by Anchor Hocking, prior to entering the service. He entered the U.S. Army as a Volunteer draftee on June 12, 1967, and went to Vietnam the first of November. In addition to his parents, he has two sisters, Sharron, an employee of Hickle's and Nancy, a student at General Sherman Junior High School. In a story from Saigon, 400 Americans were reported killed in the Vietnam War last week, 16 short of the record total of the previous week, a U.S. spokesman said today. The Defense Department in Washington announced Wednesday the deaths in action in Vietnam of an Ohio Sailor and four Ohio Marines. Military funeral services will be held Friday, 10 a.m., at St. Mark's Church for Pvt. William Edward Anderson, 19, son of Mr. And Mrs. William R. Anderson, 610 Roosevelt Ave. Rosary will be read tonight at 8 p.m. at Sheridan Funeral Home. Death occurred Feb. 9 while serving with the U.S. Army in Vietnam. At the present, due to the high casualty rate, the time and place have not been given. The family was notified by representatives from Army Headquarters, Columbus and numerous telegrams. Among the survivors are his parents, two sisters, Sharron, an employee of Hickle's, and Nancy, a student at General Sherman Junior High School; grandparents, Mr. And Mrs. Robert W. Anderson, Lancaster, and Mr. And Mrs. Edward Bushue, Somerset; and several aunts and uncles.